Looking for a good intermediate Japanese textbook? This is the one. As you guys may have already known, I’m very much reliant on textbooks for learning Korean. 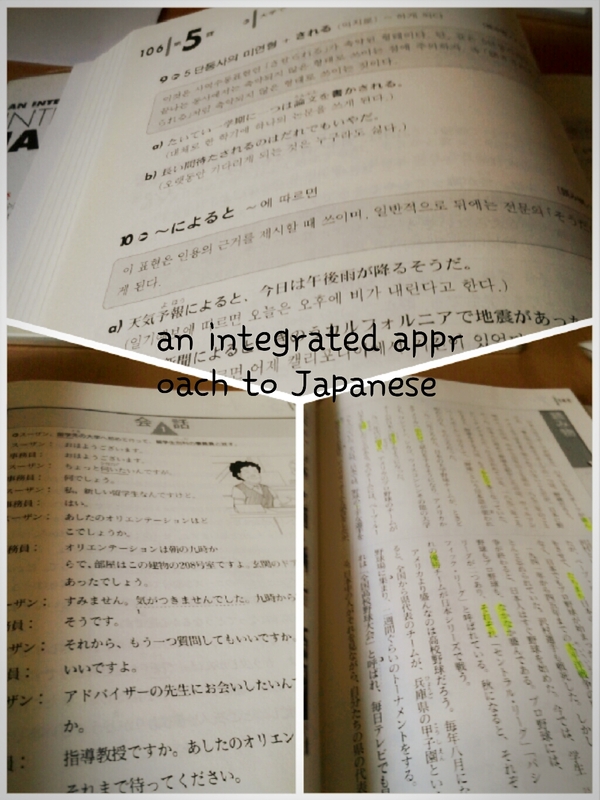 However, when it comes to Japanese, I’m strangely less dependent on textbooks. 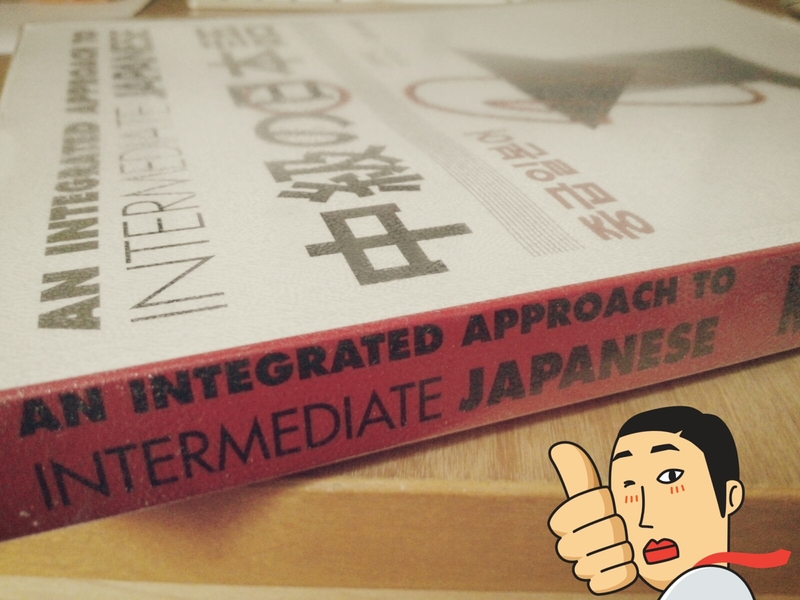 An integrated approach to intermediate Japanese is the only textbook I own / am using for now and I think it serves me well enough. This book seems to be pretty popular and is available in a number of languages. Bought the Korean version and I think it’s cheaper (12,000won w/o CDs). Well, it’s the same thing as the English version. Unlike TOP 일본어 첫걸음 which has dialogues about working and studying life, this book is more focused on students / university life. The chapters cover topics like homestay, university life etc and even the cultural tips integrated in the passages are all related to student life in Japan. Each chapter begins with cultural notes on the chapter topic and it serves as an interesting introduction to some unique features of Japanese culture. The Korean version notes compare these characteristics to what is it like in Korea and as a learner of both languages, I find it helpful! It’s great that they try to customize each language version, instead of it being a simple translation to fit all. After the culture notes, the chapter introduces 2-4 dialogues and I like how the dialogues have a variety of characters and different lengths. Formal and informal endings are used in the dialogues accordingly and I think it’s great that we are learning about the uses of different speech styles through such dialogues instead of having it spelt out in rules for us. Kanji are used in the dialogues (super important point – hate it when they try to introduce kanji gradually). The glossary is not very useful for me, since I prefer to check out the words on my own instead of relying on a glossary. But I like how furigana (the hiragana above kanji) is added, since it makes things easier. I appreciate how the furigana is not used in the main passages. Followed by a kanji list – which I ignore. Useful for those who are new to kanji! Each chapter introduces around 5-7 grammar points – a healthy number. Example sentences are ample and the explanation good. Will be better to use a grammar dictionary together with the book, since it will offer a more comprehensive and detailed explanation of the grammar points. I usually ignore all the exercises and go straight to the additional reading passage at the end. There is also a listening practice section (for those who purchased the CDs) and I find it interesting that there isn’t a transcript in the book – maybe it’s together with the CDs? I’m currently at Chapter 13 (out of 15) of the book now and I like it! It’s not too dry and pretty good for a self-studier, but I don’t keep working at it at one go. I usually do 1-2 chapters, then move to read Japanese novels for a few weeks and then come back to the book. More effective that way. Sometimes when I try to keep moving on to the next chapter, I find that I get into some kind of mental block and that the grammar points become harder to absorb. So I think a break helped me to digest what I learnt and come back to it. All in all, a good book! Recommended!! I’m planning on using this book after finishing Genki II. ^^ I’ve printed most of it out from my college’s library (the system was down so I got to print for free WOOO), but knowing me I’ll still get the hard copy when I have the money. Having a bounded book is much easier for me than having loose papers running around and hiding from me. DX I haven’t used the book much yet, but from just browsing through it I think it’s a good intermediate textbook- not too hard, not too simple. Some people say there’s too much English (or non-Japanese text) in the book, but I haven’t thought of it as too much of a hindrance. Tobira seems a lot more challenging (since almost everything is in Japanese) so I’m excited to try that series out. Have you had the chance to look through any of the Tobira books? Where did you get this? I went to Bandi and Luni and I can’t find it there T^T The book looks so interesting! I’ll study Japanese again when I finish my 귀화면접. mm cant remember >< I think it was either in the COEX bookstore or kyobo. hehe just get it online! All the best for your 면접! !